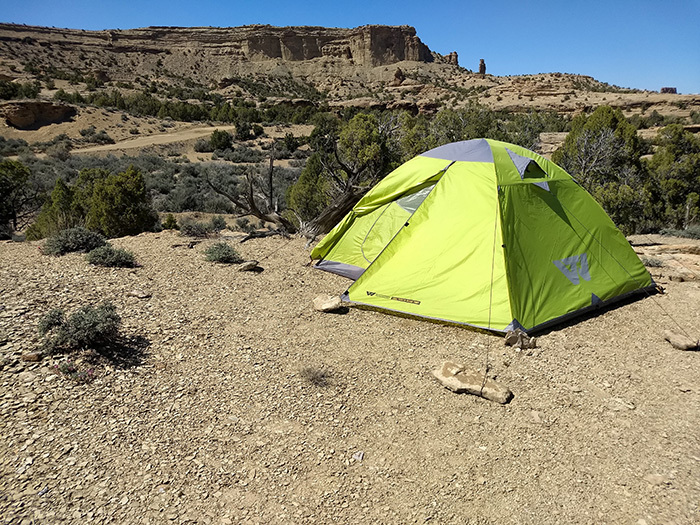 Spring has full on sprung here in NE Utah, perfect conditions to test out a tent from Next Adventure – the Wilderness Technology North Quad. This time the travels are not on a motorcycle or a drain on my finances as I’m here for a 3-4 month work project. The most efficient way of getting things done involves camping in the field 6 days a week, then one day in the little town of Vernal, UT for showering, groceries and keeping some kind of link to humanity. Not having a larger utility tent, I decided to grab the North Quad to test out as it’s reasonably priced, good sized when set up, but not a monster to haul around. The aluminum poles were a big deciding factor. If you’ve never had a fiberglass pole come apart on you count your blessings. Knowing I was going to be living in this thing all summer I wanted dependable materials that are easy to field repair. So, after 5 weeks of living in this tent, what are my impressions? Well, hell! That’s what this whole thing is for! It’s what I’d call a buddy 4-person tent. Meaning, if you’re going lean and mean with 4 close friends, 4 will fit with a little stuff, but it’ll be tight. As a solo base camp tent, it’s plenty roomy for a ton of gear, a comfy bedding area and a few square feet for lounging about, getting dressed, etc. A perfect 2-3 person tent with gear and/or dog for most uses. The large dual vestibules allow for keeping a good deal of stuff you may not want in the tent to still be protected and if you need to hit the head in the middle of the night, no need to crawl over anyone, just bust out either of the large side doors. The vents keep air flowing, or you can seal it up nicely to trap some heat and keep the weather out. Spring here in the Uinta Basin is a tumultuous affair: strong winds, great variances in temperature, and lots of sand, grit, and dust. Not to mention the sun at 6000 feet. We’ve had 6 high wind advisories in the 5 weeks here with sustained winds of 25-30 mph and sustained gusts of 50+ mph and while it gets rattled about, this tent allows you to anchor it down like a rock. For a few episodes, I left the vestibules partially open to allow for better airflow through the tent and it got dusty but weathered the winds like a champ. The materials are holding up well despite multiple moves, the aforementioned windstorms, heavy rains and the sun beating down upon it. A couple of the grommets in the webbing at the corners of the tent body that anchor down the tent got loosened by the winds but are still serviceable and should last the rest of the summer. Not many moving parts other than the zippers and they are standing up to my constant in and out of the thing. Finally, bang for your buck. 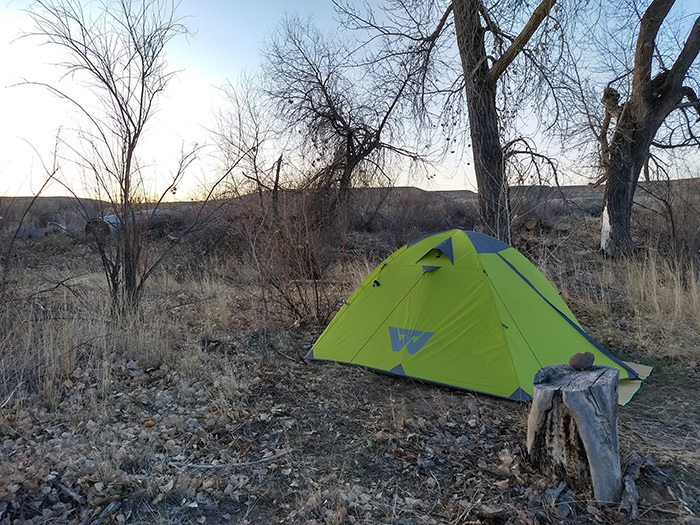 I looked around a bit before choosing this tent, Coleman and other ‘car camping’ brands have low-cost 4-person tents that are reasonably durable and roomy, but at Next Adventure you can get an affordable Wilderness Technology tent that is a level above in performance and durability. The design is based on more expensive performance tents, not recreational car camping types. After living in it for 5 weeks, I have no doubt it’ll last the whole tour and many more seasons to come. The fit and finish are a little loose, it gets tightish when you stake it down, but there are areas of sag I’ve been unable to eliminate. Some of the stitching looks like it could have been done better, but it’s perfectly solid. These are the trade-offs for a tent of this durability and price and I find it totally reasonable. Want a well-made tent that can take most of what nature can throw at it without breaking the bank? Next Adventure’s North series of tents from Wilderness Technology are a perfect fit for your, well, next adventure.